Sand filled sports pitches provide ideal playing characteristics for both football and hockey, as well as multi use games areas for a variety of sports. 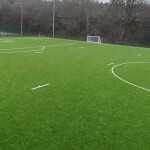 When you decide to have a 2G grass sports facility installed it’s important to select sand filled grass suppliers and and contractors who are specialists in the sport surfacing industry. Carrying out background checks and credit assessments is vital in ensuring that you choose a company with relevant experience and expertise in the sport surfacing sector. This will make sure you get the best possible 2G grass pitch with the perfect performance and safety characteristics, whether it’s for recreational or professional use. Safety should always be a top priority for any sports facility, especially if the surface is going to be used by young children at a school or club, therefore it’s vital to consider a maintenance plan which can be carried out by the sand filled suppliers. Maintenance for a sand filled sports pitch can include regular drag brushing, deep cleaning and infill rejuvenation to remove contaminated sand and replace it with a new clean layer. Most sand filled suppliers will offer maintenance advice along with the full construction process to ensure your sports facility stays in top condition for as long as possible. 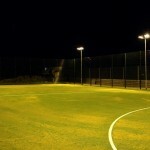 As a sand filled synthetic grass supplier and installer, we can also provide you with extra equipment for your 2G sports facility such as fencing and floodlighting to help you get the most out of the sand filled pitch surfacing. Having these extra accessories installed means that the sports facility is kept secure and can be rented out during non daylight hours for training sessions and matches. If you need any further information about the 2G sand filled sports surfacing, please take a look around our website where you can find details about construction, costs and maintenance for this kind of sports facility.